I am often asked what pruning should be done in autumn and the answer is “very little”. The main aim of autumn pruning is to prevent damage to tall shrubs during winter storms and wind rock. This falls into the category of Housekeeping pruning. It applies to late flowering shrubs that have produced tall, whippy stems such as Buddleja, Hydrangeas and modern Shrub Roses. 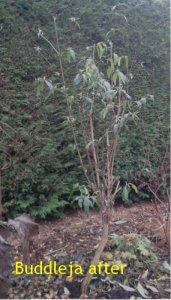 These plants have their main prune for regrowth in the spring and the object in autumn is to remove the top third of stems to reduce the height and wind resistance of the plant. Even a shrub that has lost its leaves can catch the wind and be roc ked to and fro. This may not be forceful enough to break branches but over the course of the winter it is enough to loosen the soil around the base and roots of the plant, just as you would rock a firmly embedded stake to get it out of the ground. 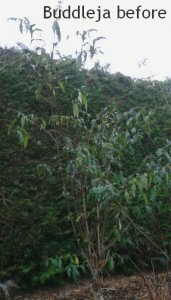 Of course, if winter brings storms there is also the risk of direct damage to these tall stems that may break or split lowdown into the framework of the shrub that you otherwise want to retain. At the same time as autumn pruning, you can cut out any dead and damaged wood and stems that are crossing and rubbing so that the bark is not worn away allowing diseases to enter. Your plants will then sit happily through the winter ready for careful pruning in spring to produce another display of flowers next summer. ← What is hard landscaping in the garden for?